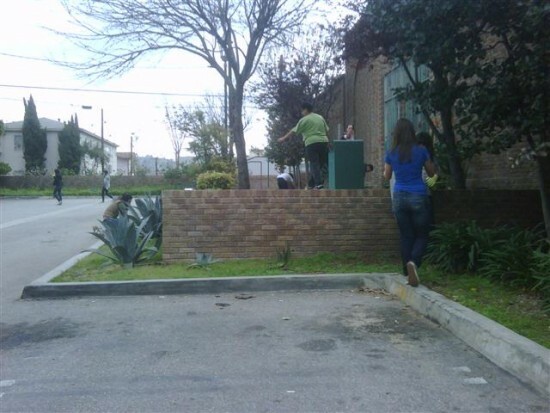 We had another mini-clean up at the Cahuenga Branch Library today, but I was mostly not there. Having been assigned to do some onsite Social Media reporting for the Council District 13 office at their LAND Summit in Echo Park, I only was present at the cleanup at the beginning and at the end of the project. Fortunately we had some help! Last month, I was contacted by Laurie Garcia, Troop Leader for Girl Scout Troop 2125 from Highland Park, who had heard about our cleanup effort (probably via the Big Sunday website) and wanted to have her girls participate. So this morning, they arrived a little earlier and I got them oriented with the tools, materials, plants and cleanup locations. They had their work cut out for them. There was a LOT of trash, mostly discarded food containers and clothes left by a few of the library’s homeless “residents.” I felt a little embarrassed, especially since they had more work to do than we usually pick up. In fact this was the most amount of trash at the Library since we started the mini-cleanups. Fortunately, there were seven girls, plus Laurie and her husband to volunteer. Amanda Colligan, who has volunteered in our mini-cleanups before joined in as well. I left her in charge as I left to go to Echo Park. After my meeting, with an hour to spare before the next one in East Hollywood, I returned to the Library and still found the troop busy at work, this time wrapping up. The cleanup was done, and they were busy watering the plants. I got to remove a few weeds. Laurie’s husband removed an entire jungle of weeds in a rear corner (even though I told them they didn’t have to do it) because he couldn’t stand how it looked. I even found out that Amanda, who lives nearby, volunteered to have some of the trash dumped in her household trash bins because there wasn’t enough room in the Library’s bins! Amanda also Tweeted a couple of times regarding today’s cleanup experience. But having 10 people total working on the Library made a lot of difference. The troop was still going up until 12:45. Laurie said, “We start to finish, we always complete our task.” All the trash was gone, and it was no easy feat. I heard some of the hardest stuff was the discarded clothing, some of which had been embedded in the ground from since the rains of the other week. It was clear to see that they did an excellent job! Ready to head off to my next meeting, I thanked the girls, all of whom were middle school to high school-aged, and told them that even though some of this community service stuff might be boring or tedious at times, when they get older it will make much more sense to them, especially after they find themselves in their own careers. I hope that made some sense to them; it certainly was my experience. So once again, a massive thank you to Girl Scout Troop 2125 for their excellent work today beautifying the Cahuenga Library! The next Cahuenga Library Mini-Cleanup/Gardening activity will be on Saturday, May 7 – I hope I don’t have another meeting that day…this would be the one-year anniversary for some of the plants! 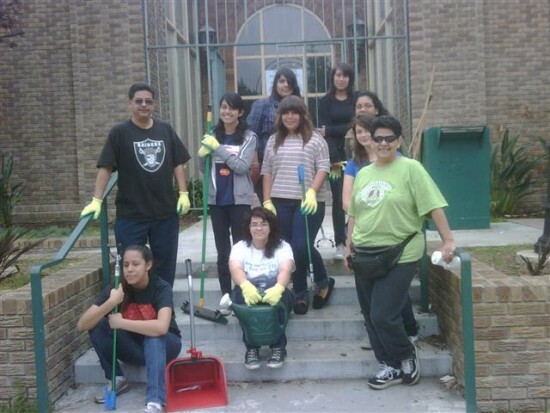 The girl scout troop did an amazing job–they pulled weeds all over the place. I don’t know if they mentioned it, but we were thinking it would be nice to have a green bin at the library. A blue bin might be good too for all of the empty beer bottles and plastics. I am so Proud of My Parents and Little Sister as well as the rest of Troop 2125. They put their heart and soul into helping the community and i am so proud of all of them. i would love to do it again .